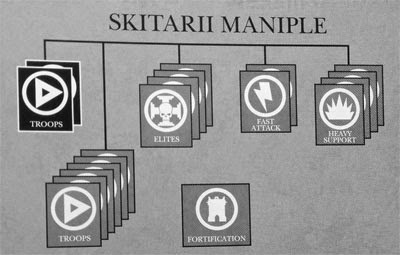 Brush Wizard: Skitarii Battle Maniple Fully Assembled! - I split the box of Rangers into 2 squads of 5. Mainly because I wanted the option of sniper rifles or arc weapons. All of this covers a bit of solid ground in the Maniple. The Vanguard and 2 squads of Rangers cover 3 choices for Troops. The Infiltrators and Ruststalkers cover 2 choices for Elites, the pair of Dragoons cover 1 choice for Fast Attack and the Onager covers a choice for Heavy Support. That leaves me with 5 more troop choices, 2 more elite choices, 1 more fast attack choice, 3 more heavy support choices and a fortification. Some things aren't finished yet. It's obvious that the models aren't glued to their bases and the Onager has his knee plates missing still. But those will get taken care of during paint. I haven't decided on a basing theme yet and I'm unsure if I want to use cork or how exactly I want to decorate them. I do know that I am looking at a Mars themed heraldry (slightly modified for personal taste), so that means I'm likely looking at Mars desert for basing as well. What I am leaning toward is green stuff the bases to give surface height variation. Then crackle paint the them. If I go with green stuff I can hide bits and pieces in the "sand" and they'll look more interesting that way. The overall plan is that since I don't have players to fight against, they will mainly be a display army. So, I'll take my time painting them and making sure they look solid. Now that they are all glued together I can go back and clean mold lines off easier too. Luckily paint should go rather easily. I used the gunner for the Onager as a test mini and kept notes of every step. Also I'm not mixing colors, so I shouldn't have to worry about color matching. But for now, that's it! The Skitarii Battle Maniple is done for the time being (until I add more to it). Now its on to the new Cult Mechanicus models, which just went up for pre-order this week.